Nissan has just announced a new GT-R variant that will be made only in limited quantities called the 2014 Nissan GT-R “Midnight Opal” special edition. This custom build will feature unique paint, special wheels, a custom spoiler, interior changes from the standard GT-R and it will command a premium price of $ 105,590.00. Although that does seem like a lot of money, the GT-R is perhaps the most streetable supercar on the planet, and at that price the added content is not beyond reason. The 2013 Nissan GT-R is the affordable supercar. At least it has been for quite a while. The price did jump up significantly in 2013. The new Midnight Opal special edition adds $6K to the price of this year’s model, which now has a base price of about $100K.. For that added cost there are a number of new features. Most costly, and most important to performance, is the addition of a “Dry finish” carbon fiber rear wing. 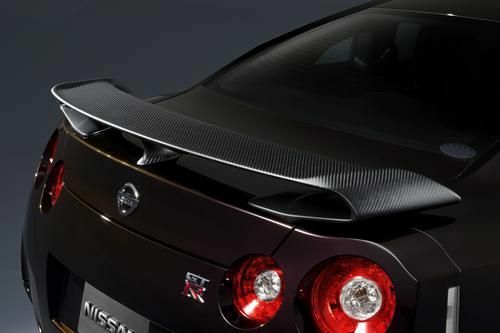 Carbon fiber is both super-lightweight and also stiff and strong. An added wing made of the material is a good use of expensive composite. The paint applied to the 2014 Nissan GT-R Midnight Opal special edition is hand-applied. In fact, each coat of the paint is done by a human. That is almost unheard of today in the world of automated paint dipping and spraying. We don’t doubt Nissan’s quality, but paint science has evolved so far it is curious that the company would choose to do a hand-paint. The paint changes hues from a deep purple to a dark blue depending on light and angle of viewing. The lightweight, forged, Rays wheels on the GT-R Midnight Opal are also customized. Their coating and color are unique. Nissan calls the treatment “hyper-titanium.” The titanium hue is intended to compliment the dark body color and we don’t doubt the effect will be popular with fans of the car. The special edition Nissan GT-R Midnight Opal is finished off with a gold-plated plaque in the engine compartment. Only 100 of the exclusive cars will be built by Nissan. Sales begin in September, but if you are serious about buying one of the world’s best supercars it would be wise to contact a dealer (or three) soon to see if you are able to secure an order commitment.